The Battle of the Somme in 1916 cost the British Armies some 60,000 casualties including 20,000 dead, outright, on the first day. (See article on Newfoundland’s Memorial Day.) General Douglas Haig’s dream – to puncture the German trench system and march all the way Berlin – was itself punctured by his plan’s epic failure. The Somme devolved into a stagnation the Germans dubbed “Das Blutbad” (The Bloodbath). In his scathing appraisal of the conduct on the Somme, Winston Churchill was suggesting General Haig be sacked, as had the former commander-in-chief Field Marshall French, who was responsible for the Battle of Loos, a September 1915 catastrophe. Churchill was obviously horrified and appalled at the conduct of the Battle of the Somme, with its ‘war winning’ promise, having devolved into a ‘wearing out’ battle that no one seemed to know how to win. But Sir Douglas Haig HAD a plan – and a new game-changing weapon. A new machine of war would break the stalemate to enable his most treasured arm of the BEF to finally ‘roll up’ the German flank, force them to ‘retire’ and maybe even surrender in a few days time. Yes, this really would be the CAVALRY’s time to shine. So it is no coincidence that 15 September 1916 would also be the historic battlefield debut of the new tracked armoured fighting vehicle known as the ‘tank’. (‘Cistern’ and ‘landship’ didn’t fly.) The tank had only recently been developed and engineered by a British war cabinet committee headed by Churchill. But for Douglas Haig, tanks were only an adjunct of war that would clear the way for that most fearsome weapon on the first World War battlefield – the horse and mounted rifleman. September 15th would also be the debut of the Canadian Corps in a truly offensive capacity. 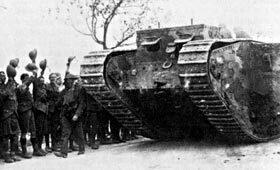 The Corps had defended the Ypres salient and had been applied piecemeal in previous British offences, but here in The Somme Valley, the Canadian Corps would be attacking with two available divisions – 2nd and 3rd – and 2nd Division would be supplied with the new tanks. The British offensive was to involve 11 divisions (including the two Canadian) on a frontage of 12,000 yards primarily against the German-occupied French towns of Flers and Courcelette. The lion’s share of the attacking divisions would be from General Henry Rawlinson’s Fourth Army. Rawlinson was chiefly responsible for the planning and conduct of the battle (though the idea of a massive cavalry breakout to victory was the brainchild of the inexplicably ever-optimistic Haig). At this point the Canadians were part of the Reserve Army, commanded by Hubert Gough – a commander so reviled that in 1917, Canadian Corps commander Arthur Currie would refuse to operate in the same army! On the far left of the British offensive, the Canadian 2nd Division (with 6 tanks) was to attack in an easterly direction (along the Albert-Bapaume road) and then swing north to capture the fortified village of Courcelette. The 3rd Canadian Division (without tanks) would make a subsidiary attack north and westward, toward the much feared and heavily contested Mouquet Farm (“Mucky” Farm in the parlance of a wry trench soldier). This attack was designed mainly to cover the left flank of 2nd Division’s advance. The main British attack, to the south-east of the Canadians – where the cavalry was waiting to win the war – was carried out by III Corps made up of 8 British divisions and the New Zealand Division. Such a new weapon was the tank that the men who commanded, drove, and manned the guns didn’t even have a proper unit that bore the name ‘Tank’ or ‘Armoured’. At this early stage, tankers were part of the Machine Gun Corps, then more specifically, as of May 1916, the ‘Heavy Section, Machine Gun Corps’, wearing the familiar crossed Vickers guns as their cap badges. 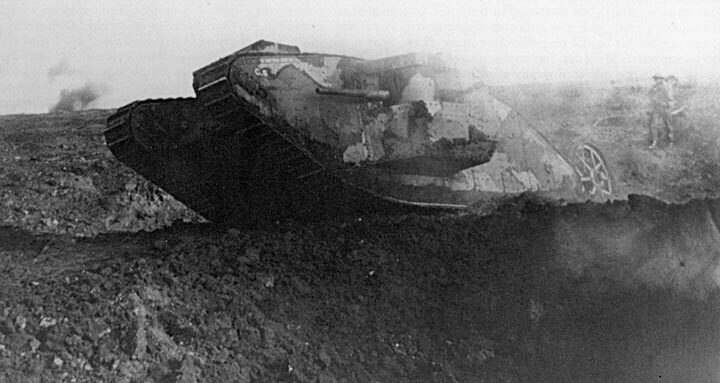 To say the tank had been rushed into production would be an understatement – the very first prototype trundled out of the factory on 13 January 1916. Eight months later a force of 47 tanks (a pitifully small number according to most) would take part in this historic Battle of Flers-Courcelette. The Mark I tank came in two variants – ‘Male’ and ‘Female’. The Male tank’s armament was two quick-firing 6-pounder naval guns mounted in a sponson on each side of the hull, and 4 Hotchkiss machine guns. The tank weighed in at 28 tons. The Female carried 5 Vickers and 1 Hotchkiss machine guns and weighed a svelte 27 tons. The 105hp Daimler engine could propel the beasts at (as listed) 4 mph over unbroken ground but given the pockmarked visage of the Somme, it would be more like 1.5 or 2 mph – at best. In other words, the Mark I trundled much slower across the battlefield than an infantry soldier in full kit attacking across no-man’s-land. The Canadian allotment for the Battle of Flers-Courcelette was 6 tanks, to be used only as part of the initial assault. There is a report that had the number of tanks at 7 (one in reserve, which would be VERY odd) but the number 6 seems more likely. The 6 rhomboid-shaped behemoths of No. 1 Section, C Company, HSMGC were all given names of refined French drinks that began with the letter C – Champagne, Cognac, Chartreuse, Chablis, Crème de Menthe and Cordon Rouge. The 6 went into action with the 2nd Canadian Division in two groups of three. The first group – Champagne (Male), Cognac (Female) and Cordon Rouge (Female) – were assigned to the 6th Brigade on the division’s northern flank. As part of 4th Brigade, the second group – Crème de Menthe (Male), Chartreuse (Male) and Chablis (Female) – were to attack, one on, and the other two astride, the Albert-Bapaume road. In the northern sector it was decided that the 3 tanks attached to 6th Brigade would move off with the infantry, under the cover of the standard artillery creeping barrage, adopted as necessary for ANY advance to have a chance of succeeding. Since they were slower than a foot soldier, the tanks were to ‘mop up’ any pockets of resistance the infantry had bypassed, a role at this stage in their development to which they were ideally suited. On the 4th Brigade front, the 3 tanks moved off before the infantry. Even though they were slower than an advancing infantryman, 100-meter wide artillery-free ‘lanes’ were left in the creeping barrage for fear of stray shrapnel striking the new tanks – which they would have no doubt survived. Thus, the creeping barrage – the one weapon BEST SUITED to protect the infantry who would be advancing in the wake of the tanks – was denied the infantry in the hope that this untried tracked weapon of questionable reliability would be an adequate substitute. As Robin Prior and Trevor Wilson so bluntly put it, “The arrival of the tank was now causing confusion where none had existed before”. At 06:20 – Zero Hour, the Canadians of 6th Brigade and their iron-clad British friends were off. For the infantry, the attacks went very well. The initial barrage had performed wonderfully and the scores of German dead and wounded the Canadians found in the front line trenches bore witness. The tankers on the other hand, had a different view of the barrage. The ground was so churned up — over weeks, not just days — by the artillery, getting going was a trial. Champagne and Cognac got stuck shortly after crossing Sugar Trench and their crews abandoned what would have been sitting ducks, despite their crews’ valiant attempts to extricate the machines from the moonscape. It was here that the only casualty to any tank crews attached to the Canadians occurred. A shell killed Pte. H. Brotherwood just as Champagne’s commander, Lt. Wheeler, had told his men to abandon the tank. Brotherwood is buried at Pozières Military Cemetery. Cordon Rouge, the last of 6th Brigade’s three tanks, however, was having a much better time of it. The tank made it across the German front line trench and drove alongside Sugar Trench, silencing several machine gun posts as it went. That done, it circled southwest, crossing the Brigade boundary, returning down along the Albert-Bapaume Road up which the 4th Brigade was attacking, taking care of any pockets of resistance left behind by the infantry. The tank’s commander, 2/Lt. J. Allen was later awarded the Military Cross for his actions on the 15th. Along the Albert-Bapaume Road the 3 tanks with 4th Brigade had a similar success-failure ratio. Chartreuse had trouble getting forward because of shell damage to its steering gear. A short time later, the engine seized and the crew was forced to abandon her. Chablis lost its left track shortly after its start and it too was left on the field. Crème de Menthe had considerable success however, making it to the Sugar Factory (a considerable strong point, just south of Coucelette and north of the main road), providing excellent support to the 20th (Central Ontario) and 21st (Eastern Ontario) Battalions fighting in the ruined factory. The tank’s 6-pounders destroyed walls and dealt with the machine guns behind them. The commander of this tank, Capt. A. M. Inglis was to receive the Distinguished Service Order for his part in the historic attack. Historian Trevor Pidgeon has remarked that this photo is tank C5 (Creme de Menthe) advancing to the attack in this still frame from a film sequence probably taken by British-born cameraman Oscar Bovill. We consider this photo to be a glass plate negative showing C5 returning from the Sugar Factory, taken by Canadian War Records Office photographer Ivor Castle. The 6 tanks attached to 2nd Division played no part in the actual capture of Courcelette, which was to fall later that day to the Canadians of the 5th Brigade which passed through the 4th and 6th Brigades and swept into the village (with the 7th Brigade of the 3rd Division on its left flank). Ironically, the Canadian attack had succeeded where the British attack to the east had not. 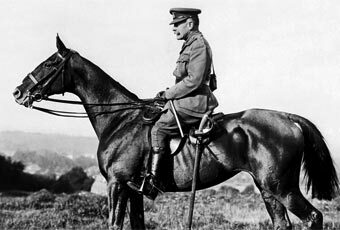 BEF Commander-in-Chief Haig would, alas, not be able to ‘push the cavalry through’ to the open country and Berlin beyond. Haig’s old-fangled dreams of victorious horse-mounted troopers would never again be realized. While the tank’s outing at Flers-Courcelette proved tactically ineffective, it was seen as an important if awkward first step in the evolution of Combined Arms. It wouldn’t be for another 14 months that an improved model of British tank would play a pivotal and successful role in an Allied offensive — at Cambrai on 20 November 1917. Even at Cambrai, Haig clung on to the notion of cavalry as saviour, but Cambrai was a triumph for the tank and a humiliation for the horse. The vaunted cavalry’s days were numbered. As for the Canadians, their stay on the Somme would last another 2 months until the offensive was finally ‘closed down’ on 19 November 1916. The Canadian Corps suffered 24,029 casualties during its 60-plus day tenure on that tortured part of the French countryside. Shortly after that, the Corps headed north to regroup, retrain and rearm on what was, for most of 1916 and the first few months of 1917, a ‘quiet front’ near Arras. This would all change on 9 April 1917. The Canadians would see to it. 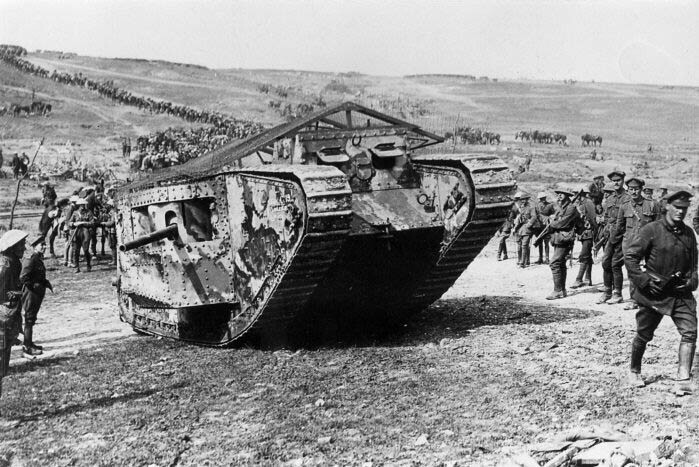 1) Applying hard lessons learned at Flers-Courcelette, the British assembled 476 tanks (many of them the new Mark IVs) for the battle of Cambrai, launched 20 November 1917. In addition to this incredible number of fighting vehicles, the infantry got to train along side them, the ground chosen was infinitely better suited for the machines capabilities and the artillery barrage was undertaken at the last minute – to preserve the element of surprise AND not chew up the ground so as to render it impassable. 2) Later on, combined Allied forces (Canadian Corps, Australian Corps, and the French 31st Corps) with 604 tanks of all types at their disposal, attacked the Germans south-east of Amiens on 8 August 1918 for what became the greatest single-day advance the Allies would make during the entire war – over 7 miles. 4) Not surprisingly, the advent of the tank also saw the advent of the first anti-tank weapon specifically designed for use by the infantry. The German Mauser 1918 T-Gewehr sported a 13.2 x 92mm armour-piercing round (slightly larger than .50 cal). But the rifle also sported a wicked kick that could dislocate a shoulder and, occasionally break your collarbone. 5) The tankers that went into battle on 15 September 1916 were members of the Machine Gun Corps (MGC). Part of the MGC was the Motor Machine Gun Service (MMGS), a unit originally organized to provide mobile machine guns mounted on motorcycle sidecars, which became obsolete due to the stalemate on The Western Front. In late 1915 and early 1916 as tanks were being developed, the MMGS became associated with this tracked armoured fighting vehicle, changing its name to Heavy Section, Machine Gun Corps (HSMGC) in May 1916. In November 1916, after Flers-Courcelette, its name changed to Heavy Branch, Machine Gun Corps, and in July 1917, the Heavy Branch was finally separated from the MGC to become The Tank Corps. In 1939, months before WW2, the Royal Tank Corps was amalgamated with existing mechanized cavalry regiments to become the Royal Armoured Corps. The Royal Tank Corps itself then became the Royal Tank Regiment within the RAC. The RTR kept the RTC badge with the familiar rhomboid-shaped Great War tank. It has only changed from King's Crown to Queen’s Crown in 1953 with the ascension of Elizabeth II. If you have any observations, comments, insights, or see any errata, typos, contact us please.